Hello, friends! I'm so glad today is finally here. I've been working on my studio makeover all month and honestly, am ready to be done with it and start creating! 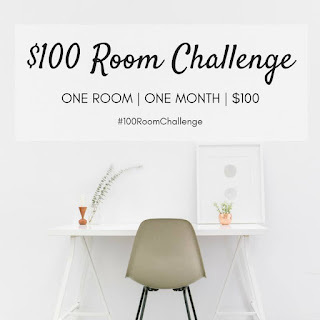 It's all part of the $100 Room Makeover Challenge, hosted by Erin at Lemons, Lavender, & Laundry. 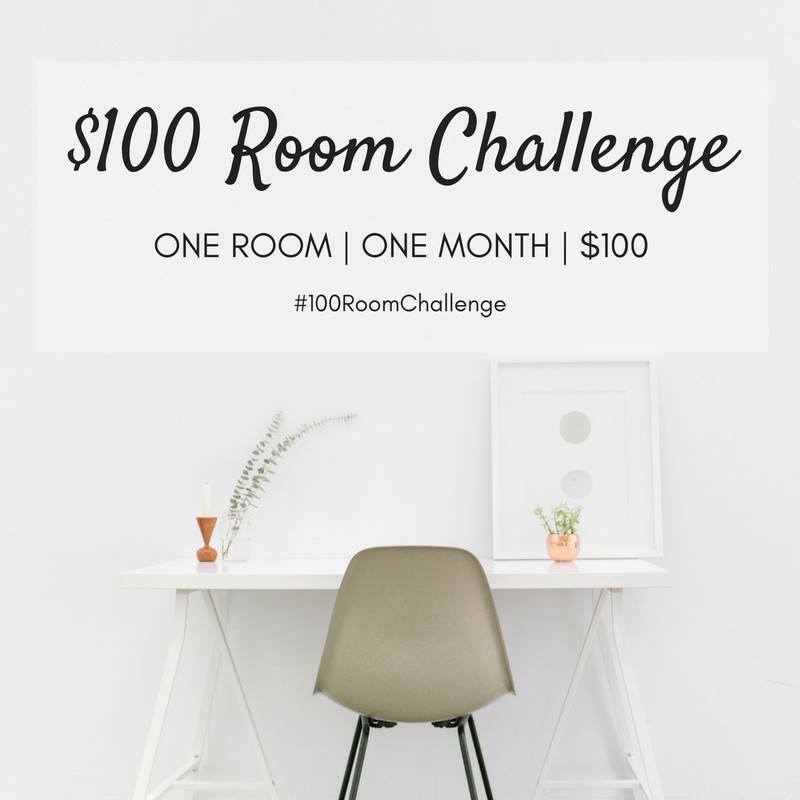 Be sure to scroll the to bottom of the post to see all of the $100 room projects. 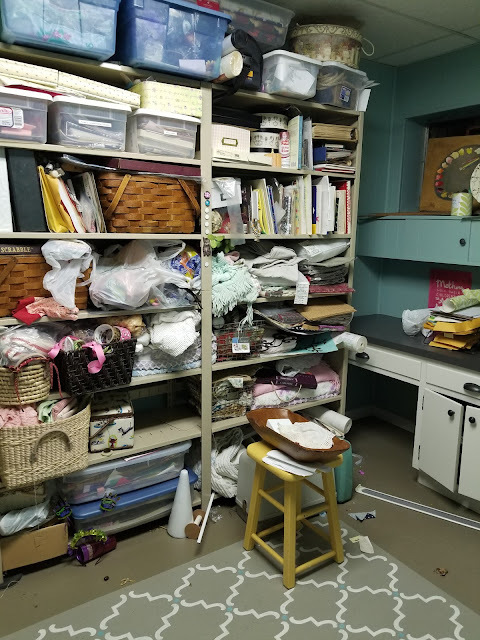 It's been a lot of work in here because it had become a dumping room. It was not at all inspiring, but was an eyesore and made me sad! 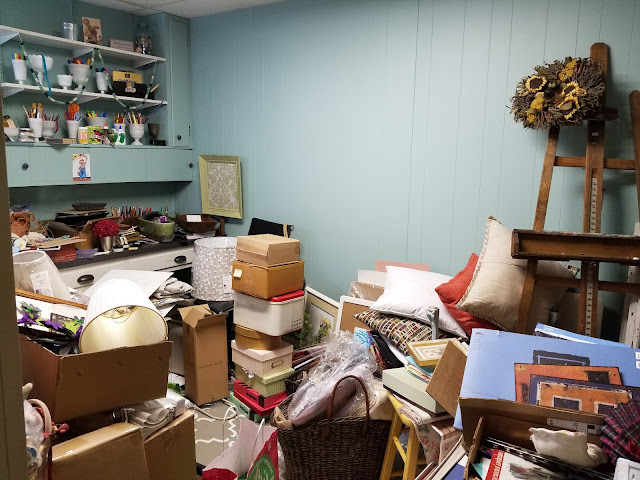 Nobody was to blame but me, so I was ready to tackle it and make it a space that's light and bright and full of inspiration. Here are the goals I had and how I accomplished them. And since I used mostly things from my stash or my shop, I actually came in a little under budget! This is a basement room with one small window so it tends to get dark in here. Although the previous turquoise color was lively and energetic, it didn't' do much to lighten the space. I used some paint I had leftover from a previous project on the walls and trim, so no actual dollars were spent for this. 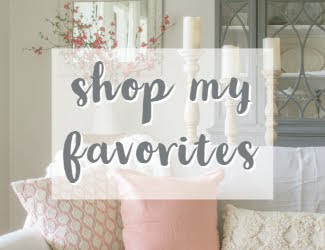 And I had purchased new ceiling tiles last summer for this room and a couple of other basement areas, so I'm not counting that into my budget since I already had it. I wasn't planning on replacing the tiles as part of the project, but once I moved everything out of the room it was an ideal time to do it. The tiles were $62.50 per box of 8 and I used a couple of boxes, just FYI. This was a major chore, as you can see by the before and afters. Here's how the left wall looked a few weeks ago. I'm embarrassed to even show it, but so glad it doesn't look like this now. And now it's much more organized and brighter. 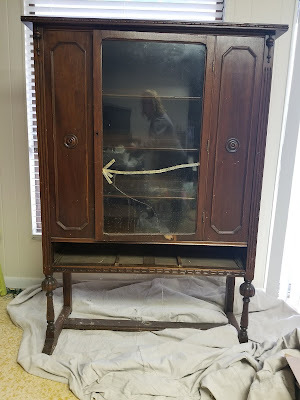 This vintage China cabinet that belonged to my late in-laws has been in the garage for several years. It had seen better days before we acquired it. 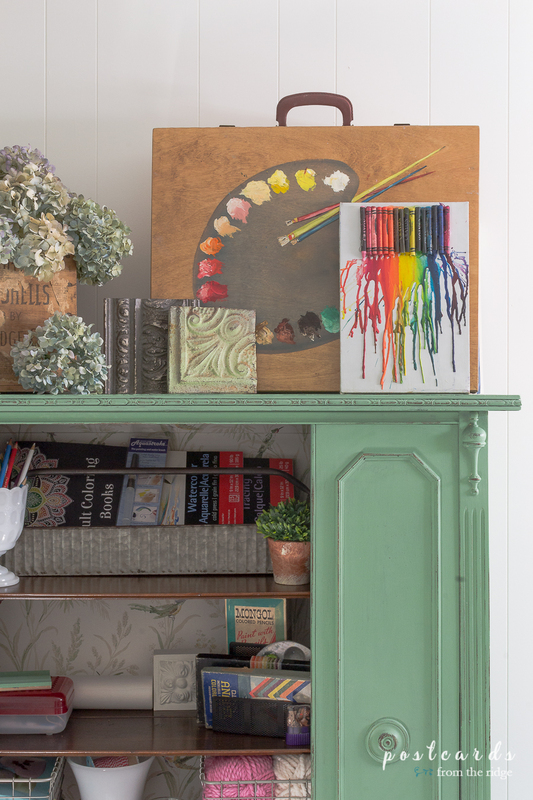 It wasn't really my style, but with a fresh, fun coat of paint it fits right into the space and makes a great storage piece. I mixed the green shade of paint using several colors from my stash. And I had the wallpaper in my stash as well. Zero dollars spent for this project. I dried the hydrangeas from the bush in our yard. And the old wooden crate came from an estate sale several years ago. The old artist's box also came from an estate sale years ago. My youngest made the crayola art a couple of years ago. The metal tool caddy is one I've had for a few months and came from my shop. 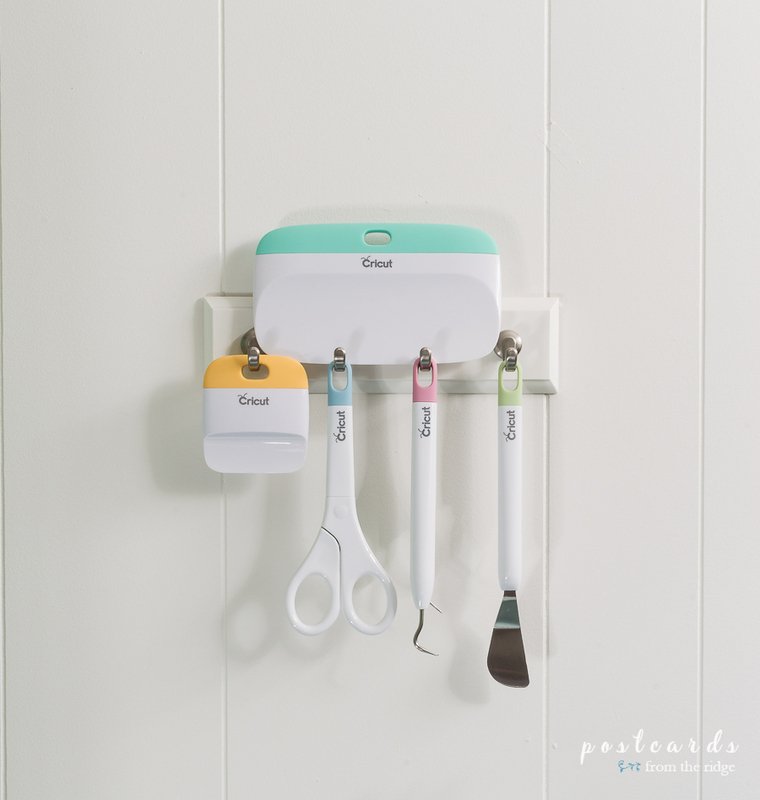 It's been all over the house and is perfect for organizing various things. 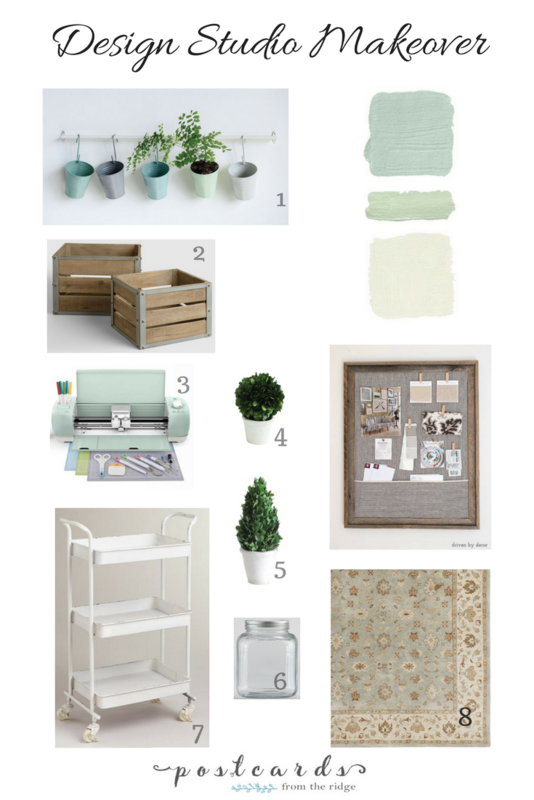 I already had everything else that you see here, including the wire baskets, milk glass, and vintage art supplies. My oldest bought me the 2 artist pads for Christmas and I can't wait to fill them up. 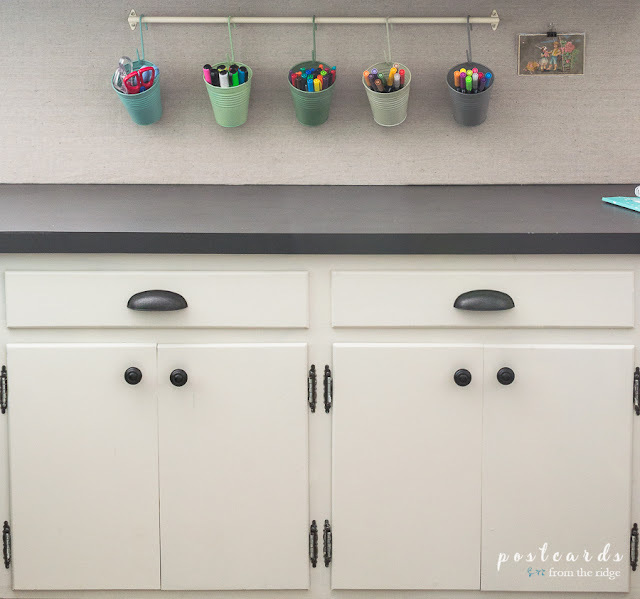 Above the counter, I added these cute little buckets and rod for holding markers, pens, etc. I love them because they don't take up any counter space. Plus the colors are so much fun! 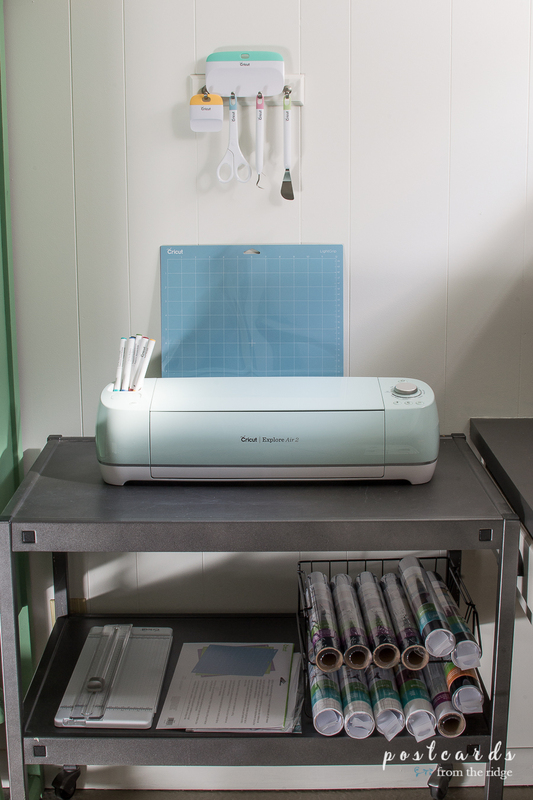 I bought myself a cricut machine during black Friday and needed a place to set it up. I'm using a commercial printer cart that I gave a facelift to several years ago. It's perfect and matches the counter almost exactly. No cost for this. See the cart before and after HERE. This little key holder rack was previously hanging on the opposite wall with scissors and a hole punch on it. I moved it above the cricut machine and it looks like it was made for the tools. No money spent on that either. Here's how the room looked when I redid it almost 6 years ago. (notice that the ceiling tiles don't match and one of them has a stain on it). The turquoise wall color, although pretty, wasn't helping to lighten the space. And sadly, here's how it looked at the beginning of this month. I have no idea how I let it get this bad in here. It looks so much better now. Most of the things didn't come back into the room. Many of them are still in the basement living area so I'll be sorting through it for the next few weeks, deciding what to donate and what to sell. 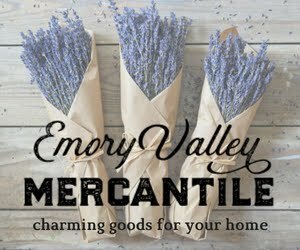 If you need supplies, let me know and I'll probably give them to you! The shelves in here are pretty much just for decoration at this point and I had fun styling them with items that fit my personality. I wanted the room to be white with little pops of color. 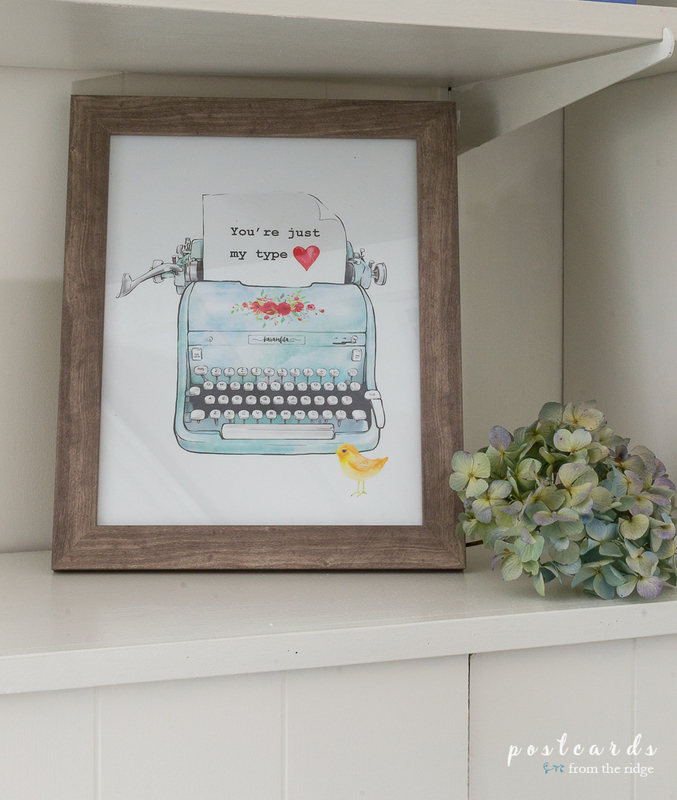 I added things that inspire me like the watercolor cards and printable, one of my favorite photos, and the letterpress art. And I wanted some whimsical things as well. The crown and little wooden figure gave me that. The only things I spent money on here are the little preserved boxwood topiaries and the buckets hanging from the rod. All of them are from my shop, so I didn't actually spend the full retail amount. I got them at cost. And the large, linen-looking bulletin board above the counter is one that I made last week using leftover materials. You can see the full tutorial HERE. It was a no cost project for me as well! Here are a few of the whimsical details I added. 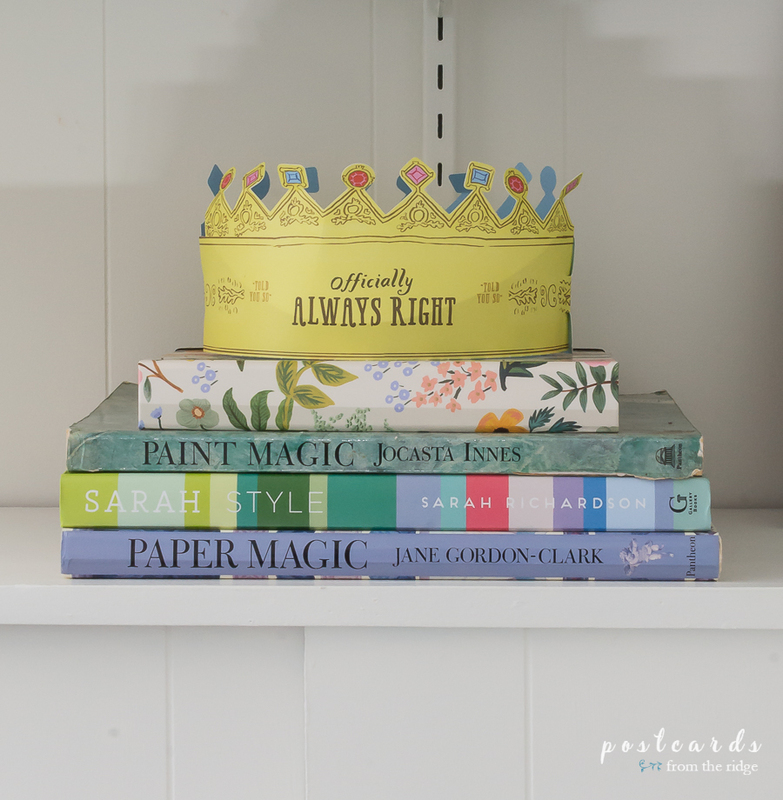 My oldest gave me the paper crown a couple of years ago at Christmas. Is she trying to tell me something? I guess if the crown fits, wear it! 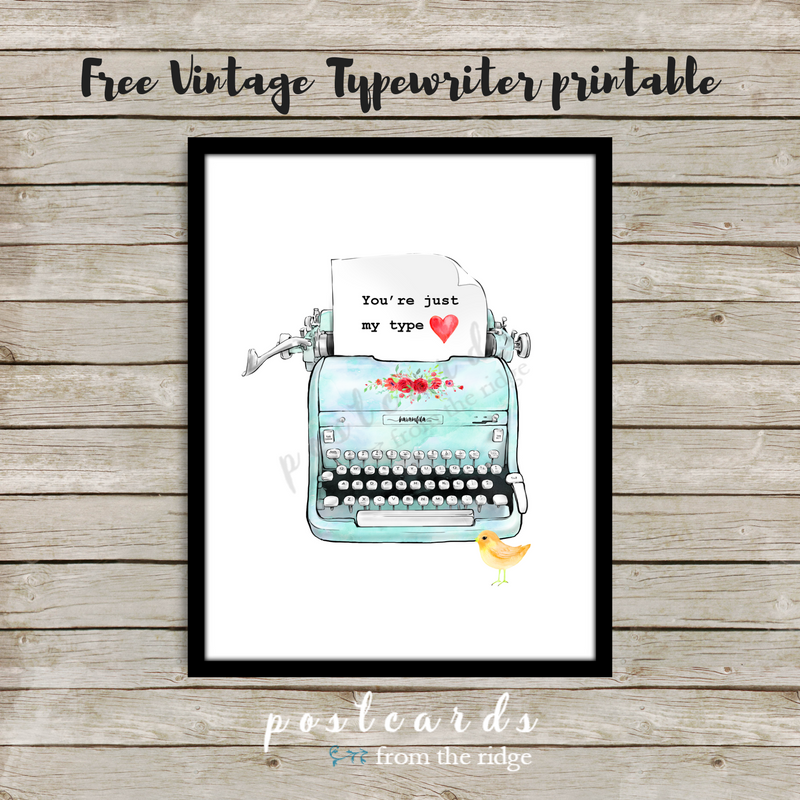 I created this fun typewriter printable using several different graphics. If you want to download it for yourself, you can join our subscriber group and it will be yours for free! It can be used for Valentine's day or any time of the year. The wooden figure came from the same estate sale as the wooden artist's box and the easel several years ago. I got a ton of art items for next to nothing. I already had the milk glass and wine crate. And the metal house was part of my Christmas decor. 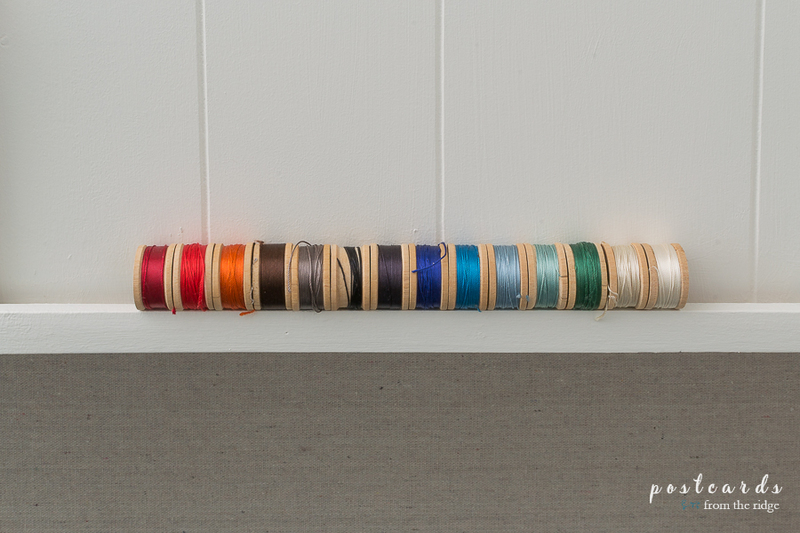 I added some of my velvet ribbon for a pop of color. And do you see the little vintage football player Valentine's card? I found a bunch of them that were in a box of items that came from my in-laws' house. Sometimes you find treasures when you're sorting through junk! And I'm happy to say that I'm on my way to being more creative since my youngest and I started an art class at our local art center last week. It's a mixed media class and we'll be learning all kinds of techniques. I can't wait to learn more! *Since these items are from my shop, I didn't pay this much for them. I got them at cost. So, I came in under budget! And here's my original mood board. I've got a different bulletin board and cart, used picnic baskets instead of the crates, and decided not to use the rug from the master bedroom. But the overall look is the same. I'm sure I'll be doing more in here, including organizing the double closet which I haven't shown you yet. I've already started on it but have more to do. 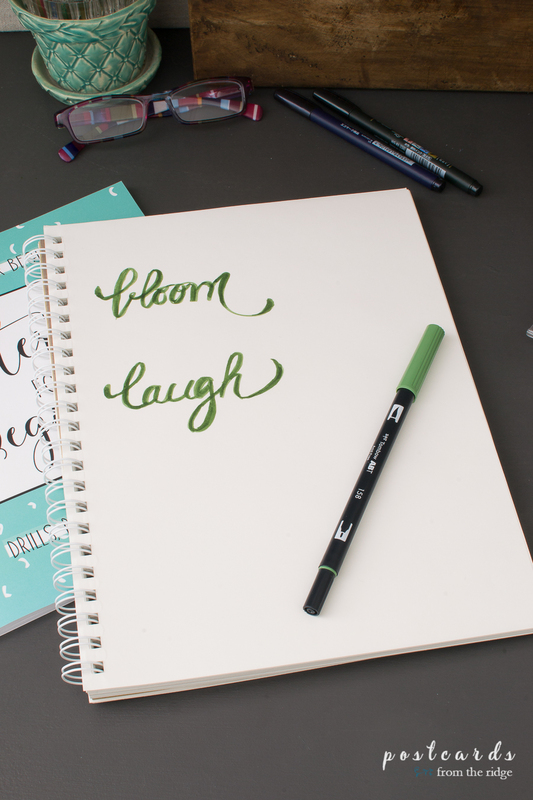 I'll share updates as I finish various projects, so be sure to join our newsletter. Go HERE to see the details. For the details of this room go HERE. 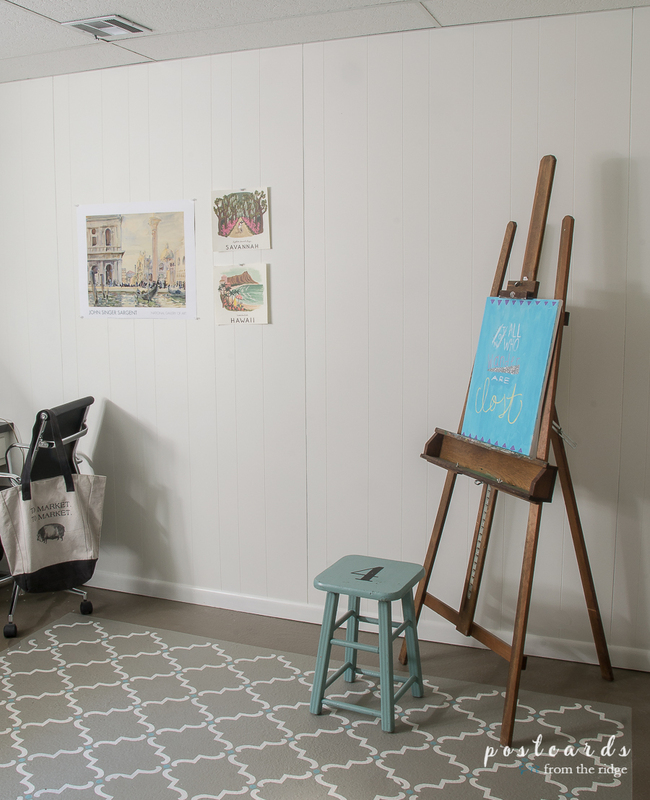 Now it's time to see everyone else's $100 room makeover projects. 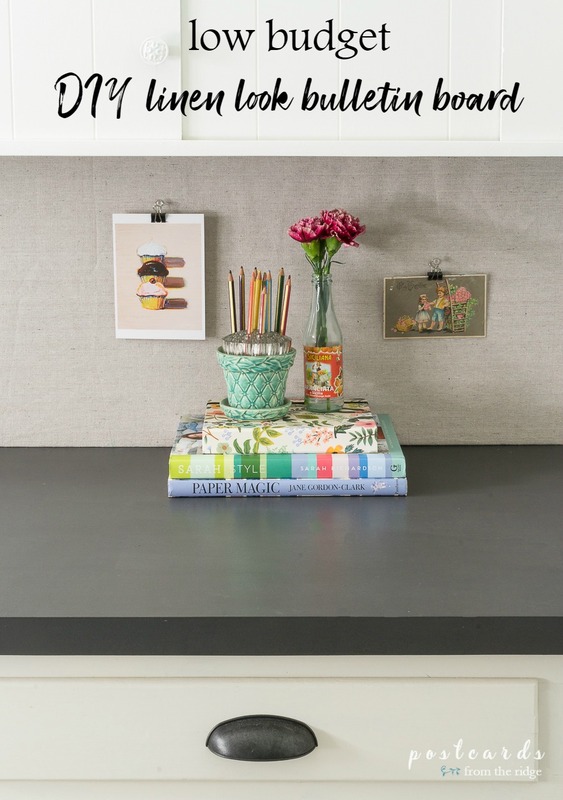 Scroll down a little further and get lots of ideas on how to makeover your space with a small budget. Your space looks wonderful! I know you are going to enjoy working in here now that it looks so beautiful and is organized. Wow, Angie! Your office is goregous! What a beautiful space to work in. Functional and beautiful! This turned out so great Angie! I love how fresh everything looks with white paint. That old hutch is gorgeous too! 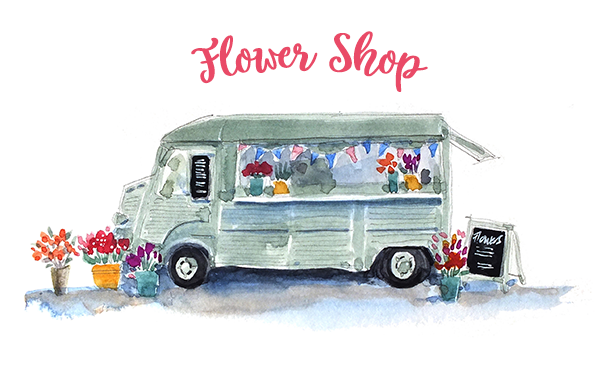 I just checked out your shop, there are so many fun items! Wow!!! This room doesn't even look like the same room!!! I LOVE it! My favorite part is that gorgeous green you painted that piece!! It is absolutely stunning!!! Great job!!! It's absolutely gorgeous Angie! 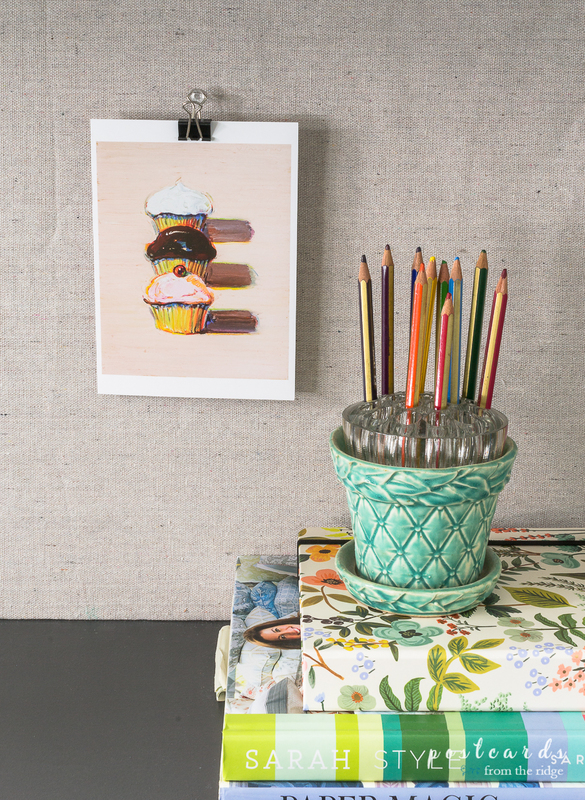 I love all your organizing ideas and your vintage accents are spot on! 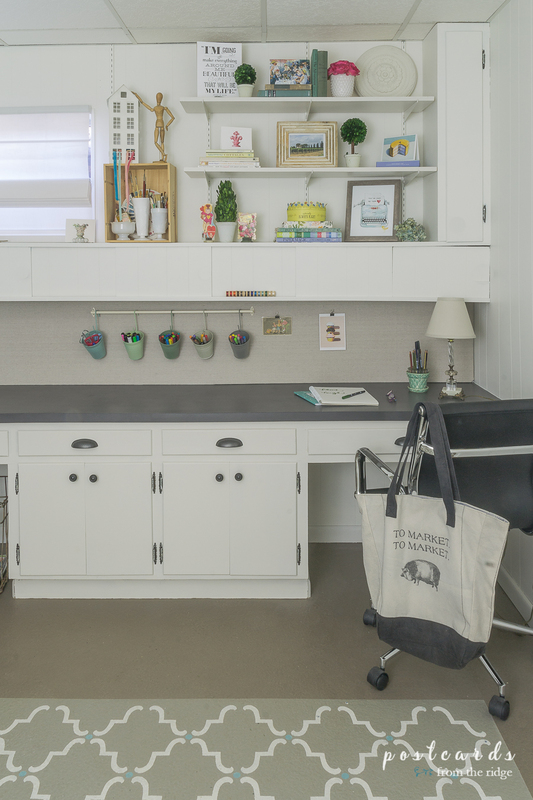 This space is stunning and it looks so organized and like the perfect place to create! I love all your decorative ideas, and the green paint on that furniture is perfect! It's such a happy place now. I bet it'll be so much easier to work in such a beautiful space! What a beautiful and inspiring space to work in! I love how you combined function with beauty. 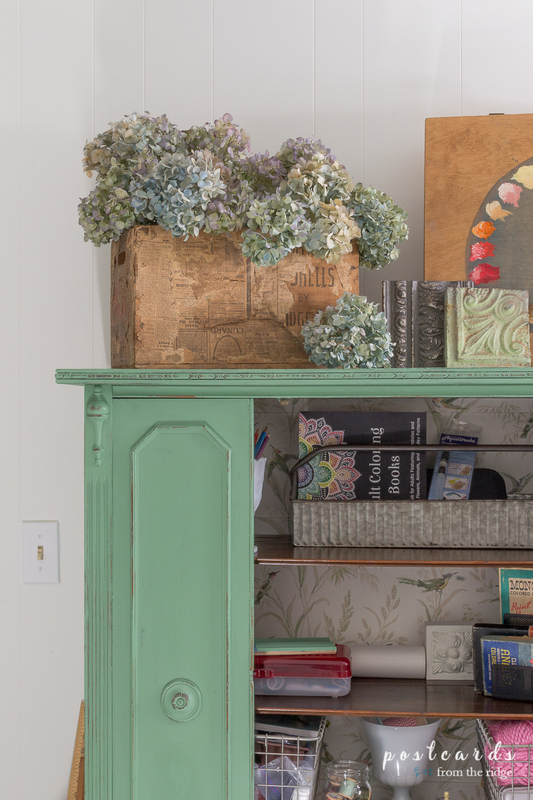 I think my favorite is the green china cabinet makeover- love the pop of color! Great work! Oh my gosh I'm in love! Every little detail in here makes my artist's heart happy. 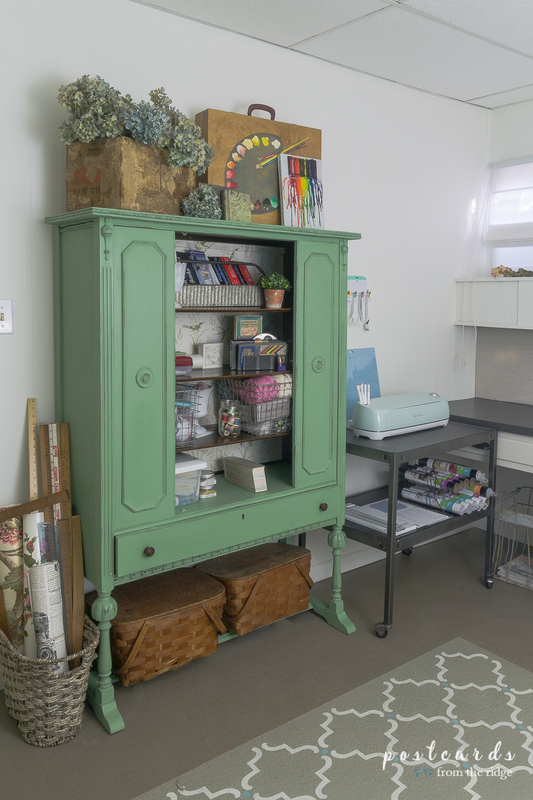 Love what you did with the hutch, and how you organized your cricut supplies. This turned out beautifully! 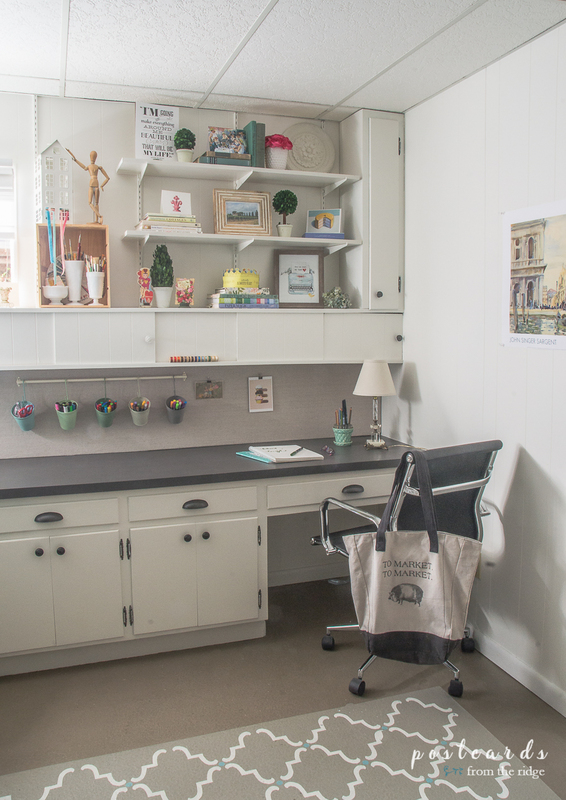 What a fabulous space to create in! I love how light, bright, and organized it is. And that green China cabinet is fabulous! Your room looks so great! I love how bright it is and all of the organizational items. And that green cabinet is to die for! 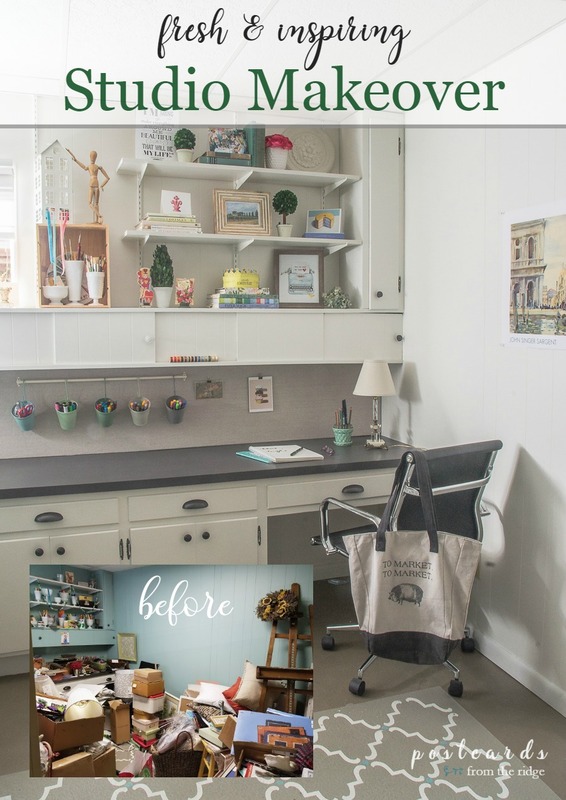 Oh Angie this is such a beautiful transformation and re love of this space. My mouth is hanging open with all you have done. Beautiful. You go girl! Can I ask you where you got that crayon picture with the bleeding colors and the suitcase type box with the painted with the paten painted on it? Great Job! I love it! I would live in that room! This room is beautiful and that cabinet is gorgeous! I love all of the vintage touches and things you have created. So pretty! You couldn't get me out of there, it's comfy,cozy and a great place to get things done. It's also pretty and brings a smile when you enter. It look amazing in here!!! I think painting was definitely a good choice and I LOVE that green cabinet. It works so perfectly in this space. You did a wonderful job!!! Thank you so much for joining in on another round of the challenge! It looks great! 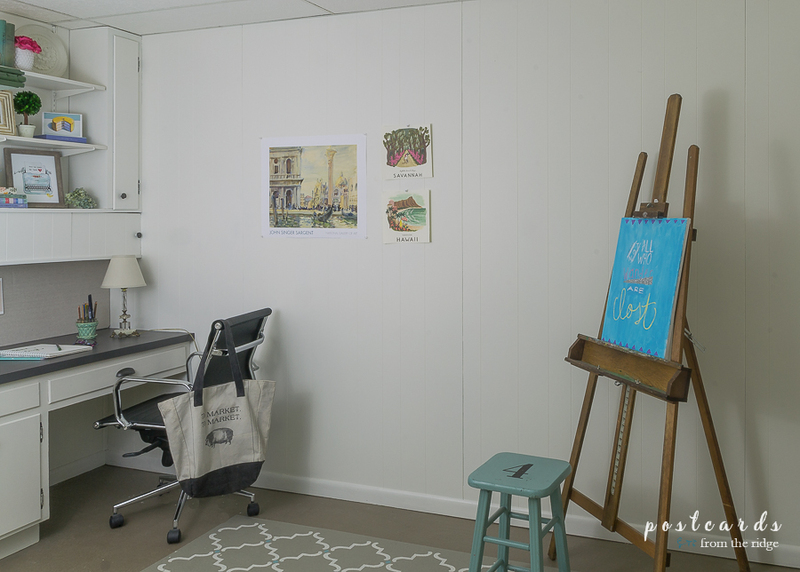 So bright and fresh-the perfect place to let your creativity flow! 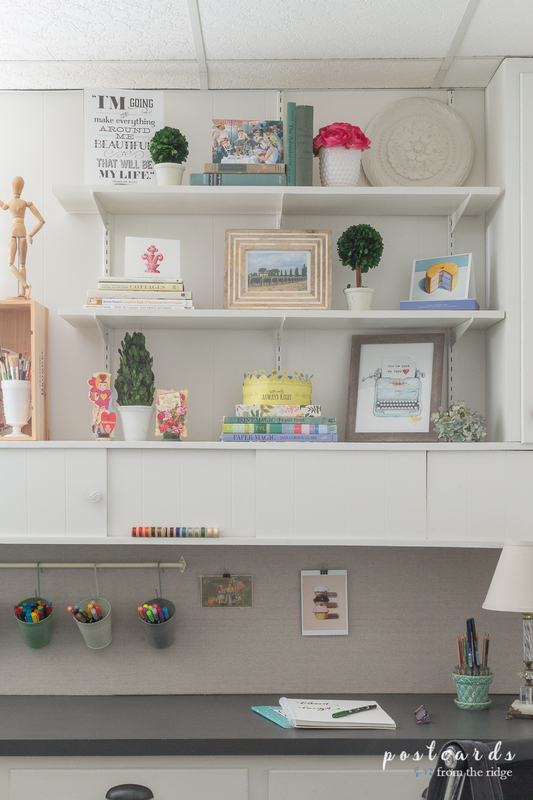 What a Wonderful way to use a family piece for storage! Everything looks lovely! Have a great time at your art class with your daughter! Angie, this is fabulous! 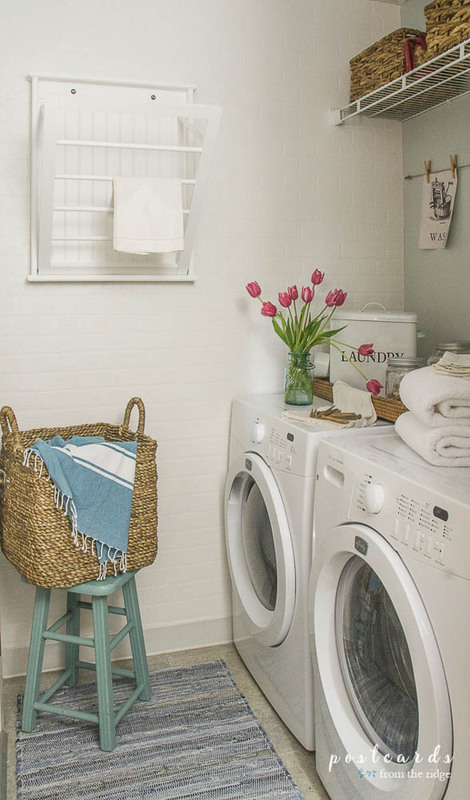 I loved your laundry room make-over but this is even better. You can really get a feel for what is important to you - thank you for a glimpse of that! 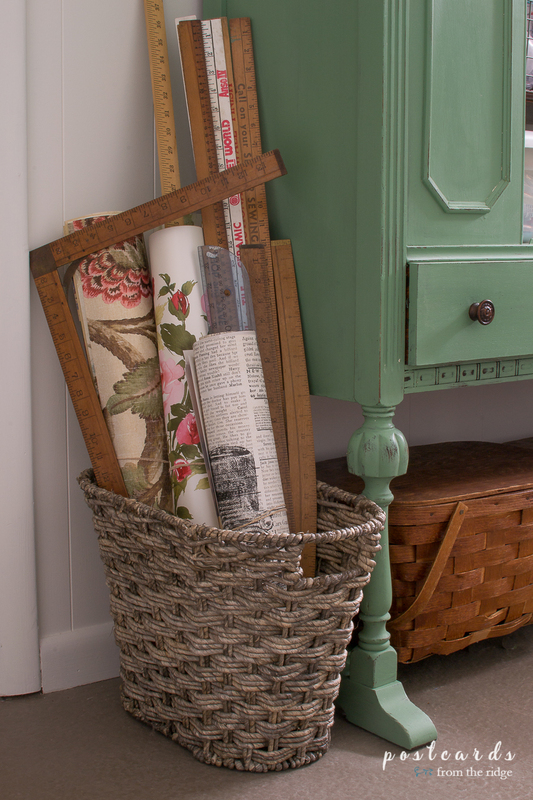 I love that you used many upcycled items but managed to pull them together so cohesively! 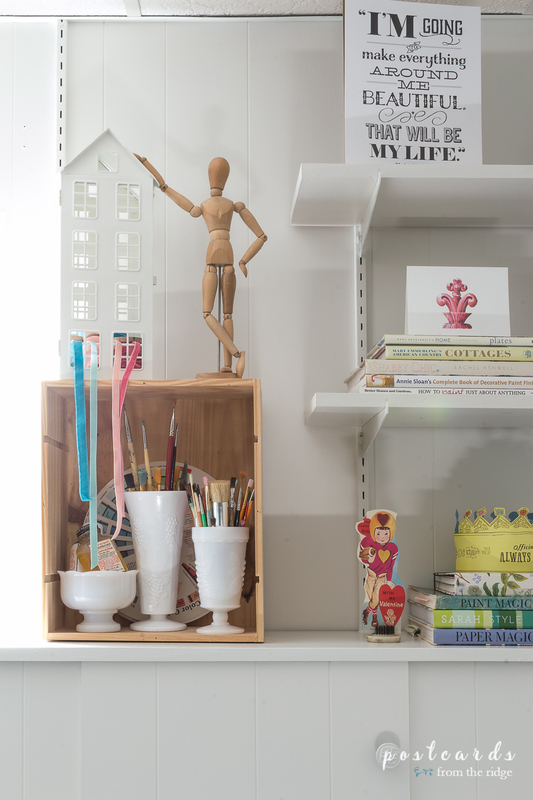 Your styled shelves are so fun and personal - I hope you have many, many years of fun and creativity in your new space! By the way, I'll be on the lookout for that crown! 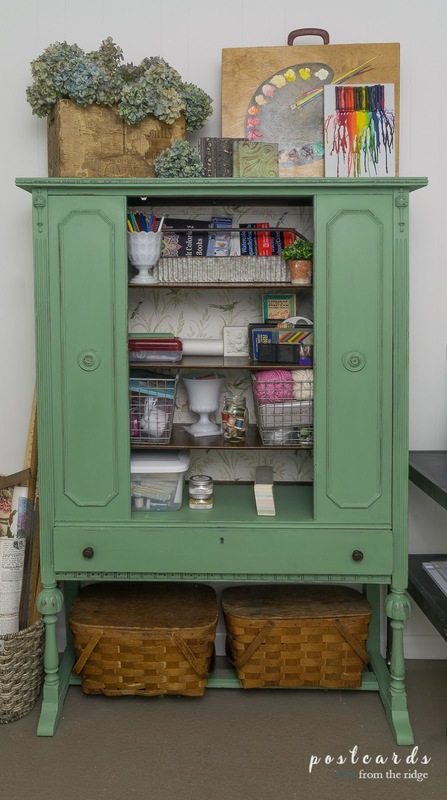 I am in love with that green cabinet. I also really love all of your special decor touches. Just beautiful.